Little House Home Arts: One Finished and a Whole Bucket List to Go! Finished at last, my own 9 patch, 9 patch quilt made from a collection of materials that a friend sent to me. Her mother, like all good sewers, went to her grave with many fabric left over! It is one of three of my first machine quilted quilts and I cannot lie, it was pretty discouraging. I had no idea how much work Quilt-As-You-Go Quilts can be. Yes, I am still whining about NOT having a big quilting machine but nearing seventy years old, I have to wonder about whether or not it is worthwhile to invest in a pricey big table quilting machine, besides which where would I put it? I would be glad to give it my bed space, but then, I have to consider my husband, who already claims that his house has turned into a sewing and quilting studio!! I realized some time ago that "finished is better than perfect! ", but recently I have realized that at best I fit into the "beginner category" and that I will likely never produce prize-winning quilts! This was and remains a very humbling realization that wounds my quilter's pride! My quilts are lessons to me and I am continuing to make them all just a little bit different, so as to find ways to overcome my shortcomings. Navigating a large quilt on a small home machine is not as easy as some of those blue ribbon-winning quilt-makers make it look! To quilt large quilts on a small home machine, sometimes the quilter does so by breaking them into smaller sections to quilt and then joining the sections. They put sections together by using "joining seams" where you stitch the front and back separately. The front is simply seamed together like sewing any other seams with right sides together. 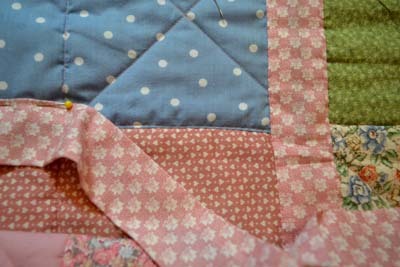 To use the "quilt-as-you-go" technique, you have to carefully trim your batting so it lays flat over the front seam and then fold under and hand-stitch the back seam. If you are quilting "stitch-in-the ditch", which is quilting in, or right next to the seam, you will find that most often the seam on the front and the one on the back don't match, and so as you sew your stitch-in-the-ditch quilt seam on the front side of your quilt you often are left with quilt stitches on the back side that don't come close to being next to the seam. You then cover this imperfect quilted seam by sewing on "fake" sashing strips by hand to cover this quilting on the back side. Back side with hand-appliqued "fake" sashings to cover the joining seams. The work involved is amazing for joining seams have two individual seams to sew, and then another to quilt next to the seam and then hand-stitching cover strips on both sides of the joining seam on the back side, making five seams for every one joining seam...Yowie!! That is a lot of sewing, and all so you can quilt faster by machine than by hand?? NOT so sure about that! ?....I think I have just added years for each quilt waiting to be machine quilted, and I was already wondering if I would live long enough to finish them all! No wonder I call it "my bucket list of quilts", for I am sure to kick-the-bucket after all the years it will take to quilt them, and I don't seem to be getting faster either!! 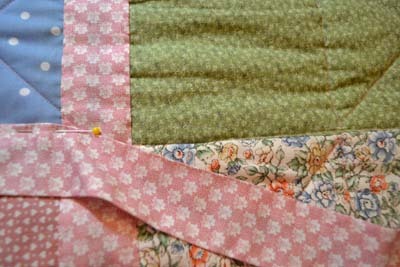 Fake sashing strips cover the less-than-perfect back quilting stitches. Fake-sashing strip is sewn on by hand and covers my many sewing sins! In the end you want your quilting lines to look continuous if you pick a quilting pattern that is quilted to the edges of your blocks. But for me, a beginner, this meant picking out some stitches along the edge to make room for joining seams. A very big whoops on my part! This is not a quilt suitable for a quilt show, though it will likely keep us warm while we sleep, if I just remember to shut the lights off, so as to focus on sleep and not my imperfect quilting! I am learning that no matter whether my quilts win contests or not, there is value in every quilt! My hand tied comforters are treasured items among my relatives and some are still waiting for one of my less than perfect, but completed comforters! 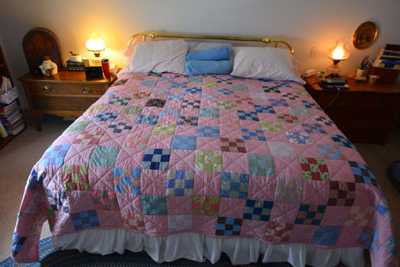 Beauty is in the eye of the beholder and so I will find those that will treasure one my home-made comforters for its lofty warmth and will think fondly of me for sending them one and appreciate my colorful patchwork done to suit them in their personal colors. They are not looking for perfection but enjoy receiving something tangible and appreciate that it was stitched with love, despite my frustration in all its imperfections! 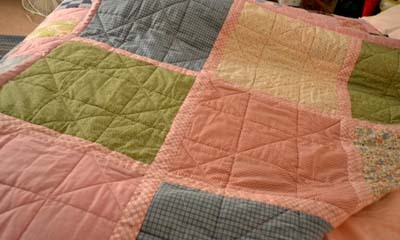 I will not, however, give up on challenging myself to create more perfect machine or hand-quilted quilts as well! I am also learning that children's quilts past-due are not so fashionable when they no longer fit the child that grew up too fast and is now an adult! Favorite patterns and colors can change during a lifetime and so quilts need to be timely as well, especially when they are now shared with a mate! This quilt taught me that the overall look is what scrap quilts are all about, sometimes less than coordinated fabrics can be charming when mixed altogether. It also taught me to try to relax as I quilt, as hanging on too tight can create stitches that are too small and have a tendency to pop when we gently tug on it to cover our shoulders! Regular weight thread may also NOT be sufficient for the weight of the quilt. I do worry that despite how many seams are in this quilt, I am not sure how long it will stay quilted, though likely, with care, it will last our lifetime? It is the process that counts and maybe when I have sewn many quilts, each designed to correct the previous quilt's errors, I just might create a show-worthy quilt? I will content myself for now to simply enjoy the process using varied designs and fabrics, and not focus on winning any ribbons! I will continue to look for a quilting machine that will expedite my quilting, and hope to find one that will capitalize on my limited talents! Of course it must be at the right price, simple to operate and have a long enough sewing arm to allow for bigger pieces to be quilted! I will continue to go to quilt shows and dream of still more quilts to make. It isn't about having the right number for our beds, but rather about the creativity and love of fabrics! Did I ever mention that my name is Jane and I am a fabricaholic and a full-feldged member of Fabricaholic Anonymous! It is true and so I can expect a bucket list that will never grow shorter!